While tap water may look clean, lead can get into your water through leaching lead service lines, or from lead contained in household plumbing. PUR, the #1 selling brand in lead filtration among filters certified to reduce lead (based on nielsen sales data for the 52 weeks ending 1/13/18), brings you a pitcher that removes 99% of lead and reduces many other contaminants. Each PUR water filter gives you 30 gallons (or 480 8oz Cups) of clean, healthy, great-tasting water with our unique maxion technology. Maxion filter technology is PUR commitment of providing superior filtration and performance, by using activated carbon and ion exchange to reduce more contaminants than any other brand. The dispenser fits conveniently in the sink for refilling with a special fill-tray design that helps distribute weight, and handles that make it easy to fill and carry..
PUR ULTIMATE WATER DISPENSER: PUR's Ultimate Water Dispenser with a Lead Reducing Filter is WQA certified to reduce 99% Lead & 22 other contaminants, so you know you're drinking cleaner water. CleanSensor monitor lets you know when to change the filer. 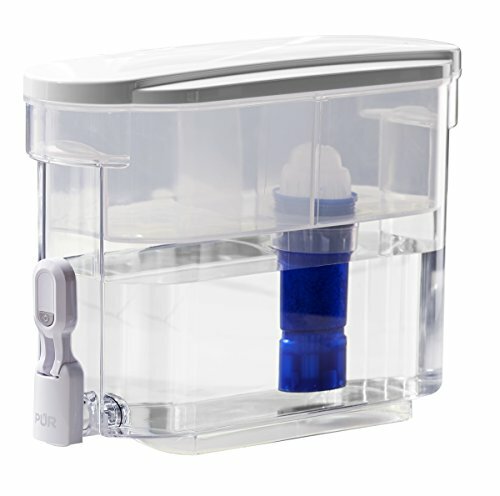 PITCHER WATER FILTERS: PUR's Lead Reducing pitcher filters are WQA certified to reduce 99% Lead & 22 other contaminants, so you know you're drinking cleaner water. PUR Lead Reducing filters provide 30 gallons of filtration (1-2 months of typical use). SUPERIOR WATER FILTRATION: PUR Lead Reducing pitcher water filters reduce 23 contaminants, including lead, by using activated carbon & ion exchange. Using a PUR water filter for tap water is more affordable than bottled water, save up to $1,000 per year.